Initially © and Licenses: Namco Ltd. / Rock-Ola Mfg. Corp. 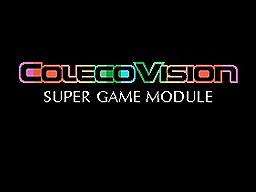 This Platform: ColecoVision & ADAM Family Computer System. ColecoVision Cartridge Casing and Producent: Standard Black U.S. Style, Moldex Canada. You are a famed Monster Fighter who is challenged with defeating an alien horde named the "Berobero". The odds are against you, but all hope is not lost. You can gain the upper hand by utilizing a mysterious Warp Zone to jump between two worlds - Space World and Maze World - and take on the enemy with lasers and time bombs. It takes precisions skills and strategy to survive to fight another day.